The schools of Buddhism are the various institutional and doctrinal divisions of Buddhism that have existed from ancient times up to the present. The classification and nature of various doctrinal, philosophical or cultural facets of the schools of Buddhism is vague and has been interpreted in many different ways, often due to the sheer number (perhaps thousands) of different sects, subsects, movements, etc. that have made up or currently make up the whole of Buddhist traditions. The sectarian and conceptual divisions of Buddhist thought are part of the modern framework of Buddhist studies, as well as comparative religion in Asia. From a largely English-language standpoint, and to some extent in most of Western academia, Buddhism is separated into two groups at its foundation: Theravāda, literally "the Teaching of the Elders" or "the Ancient Teaching," and Mahāyāna, literally the "Great Vehicle." The most common classification among scholars is threefold, with Mahāyāna itself split between the traditional Mahāyāna teachings, and the Vajrayāna teachings which emphasize esotericism. Theravada, primarily in South Asia and Southeast Asia. Mahāyāna, primarily in East Asia. Vajrayāna, primarily in Tibet, Bhutan, Mongolia and the Russian republic of Kalmykia. an alternative name used by some scholars[page needed] for East Asian Buddhism; also sometimes used to refer to all traditional forms of Buddhism, as distinct from Western(ized) forms. a movement that emerged from early Buddhist schools, together with its later descendants, East Asian and Tibetan Buddhism. Vajrayāna traditions are sometimes listed separately. The main use of the term in East Asian and Tibetan traditions is in reference to spiritual levels,[page needed] regardless of school. an alternative term used by some scholars[page needed] for Tibetan Buddhism. Also, an older term still sometimes used to encompass both East Asian and Tibetan traditions. It has even been used to refer to East Asian Buddhism alone, without Tibetan Buddhism. an alternative name used by some scholars[page needed] for Theravāda. usually considered synonymous with "Vajrayāna". However, one scholar describes the tantra divisions of some editions of the Tibetan scriptures as including Śravakayāna, Mahāyāna and Vajrayāna texts (see Buddhist texts). Some scholars[page needed], particularly François Bizot, have used the term "Tantric Theravada" to refer to certain practices found particularly in Cambodia. a movement that developed out of Indian Mahāyāna, together with its later descendants. There is some disagreement on exactly which traditions fall into this category. Tibetan Buddhism is universally recognized as falling under this heading; many also include the Japanese Shingon school. Some scholars[page needed] also apply the term to the Korean milgyo tradition, which is not a separate school. One scholar says, "Despite the efforts of generations of Buddhist thinkers, it remains exceedingly difficult to identify precisely what it is that sets the Vajrayana apart." 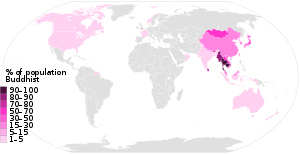 Map of the major geographical centers of Sectarian Buddhist schools in India. Sarvāstivāda (red), Theravāda (orange), Mahāsāṃghika (yellow), Pudgalavāda (green), and Dharmaguptaka (gray). The Japanese Jojitsu is considered by some an offshoot of Sautrāntika; others consider it to be derived from Bahuśrutīya. ^ Indian Insights, loc. cit. ^ "法鼓山聖嚴法師數位典藏". Archived from the original on 2013-05-28. Retrieved 2013-07-29. .